Eat what you want. 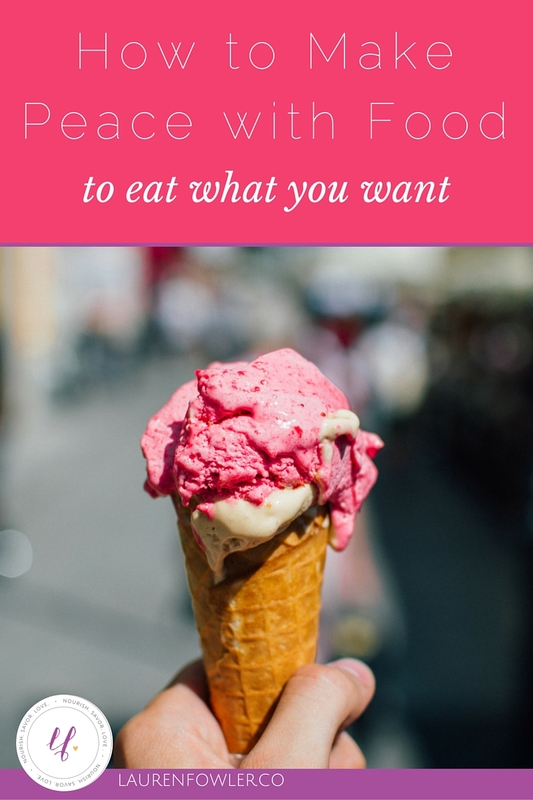 In Intuitive Eating, this is related to the principle of "Make Peace with Food." It's all about giving yourself unconditional permission to eat what you want - yes, anything you want. Start to break those food rules you have to work through your fears associated with the foods. You may be worried that you'll feel out of control if you let yourself have whatever. Honestly, at first, you may eat a LOT of the food you're restricting, but trust that over time, it will balance out. You can remind yourself that you can have the food anytime you like, then eat it mindfully to notice what you like or don't like about the food. You can listen to how food FEELS in your body. You may notice what foods energize or deplete your body, or how it feels to only eat chips and guacamole compared to having a varied, balanced meal. When you're no longer consumed by guilt or weight-worried food thoughts, you can actually listen to your own body. Personally, this helped me choose a balanced, nutritious diet more naturally because it feels good in my body, and I truly want to take care of my body. I know that having a lot of sugar depletes my body and eating a variety of whole foods feels really good, so that's how I eat most of the time. Of course, the balance isn't always there, but I never feel guilty about it.